More Info: Illustrations of bright red Amaryllis flowers are featured on this pop up snow globe Christmas card from Up With Paper. The globe measures four inches tall when expanded and folds flat for mailing. Includes a coordinating tag for your personal holiday message. More Info: This cute snow globe design pops up to reveal a 3-dimensional image of a polar bear decorating a Christmas tree while a penguin and walrus exchange gifts. An igloo and fox can be seen in the background. Sparkling glitter is used throughout the artwork to bring a wonderful sparkle to the snowflakes, mountain tops, ornaments, scarves and igloo. The message tag reads 'Merry Christmas'. This globe measures five inches tall when expanded and folds flat for mailing. No additional postage is required unless additional weight is added. Write your holiday message on the stationery sheet included with the card. Up With Paper's award-winning pop-up snow globe greetings have been a sensation since their introduction in 2005. More Info: This beautiful snow globe Christmas card design pops up to reveal 3-dimensional images of a colorful snow covered house that is decorated with candy cane stripes, colorful lights and sparkling glitter accents while the message 'Merry Christmas' can be seen on the roof. Small evergreen trees and candy canes decorate the front yard while snow appears to be falling to the ground. This globe measures five inches tall when expanded and folds flat for mailing. No additional postage is required unless additional weight is added. Write your holiday message on the stationery sheet included with the card. Up With Paper's award-winning pop-up snow globe greetings have been a sensation since their introduction in 2005. More Info: Who could resist this wonderful 3-dimensional holiday greeting that features a group of dogs playing in the snow. Up With Paper's award-winning Pop-Up Snow Globe Greetings have been a sensation since their introduction in 2005. This large globe measures six inches tall when expanded and folds flat into the included note card and envelope. Write your holiday message on the note card, insert the snow globe into the note card, and insert both into the envelope. 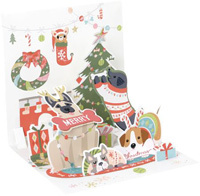 More Info: Dog lovers will enjoy this wonderful pop-up Christmas card from Up With Paper. 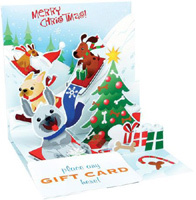 Opening the card reveals die cut images of a german shephard, labrador retreiver, boxer, and pups as they frolic in the snow. Glitter highlights bring a sparkle to the snow on the tree branches. Write your message on the back of the card. Extra postage required. More Info: Write your message on the back of the card. Extra postage required. 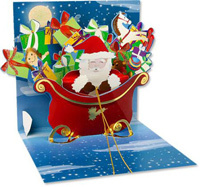 More Info: This snow globe Christmas card pops open to reveal a classic image of Santa leaving treats and presents. The globe measures four inches tall when expanded and folds flat for mailing. Includes a coordinating tag for your personal holiday message. More Info: A 3-dimensional image of Santa leaving presents near the fireplace is revealed when this snow globe design is opened. Since 2005, Up With Paper's award-winning pop-up snow globe greetings have been a big hit. This globe measures five inches tall when expanded and folds flat for mailing. No additional postage is required unless additional weight is added. Write your holiday message on the stationery sheet included with the card. 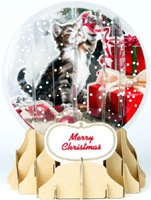 More Info: This wonderful snow globe Christmas card pops open to reveal a cute kitten playing with a ribbon. The globe measures five inches tall when expanded and folds flat for mailing. 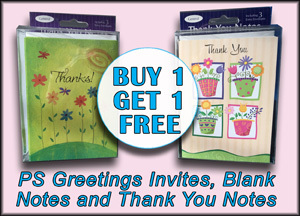 Includes a coordinating stationery sheet for your holiday message. More Info: Up With Paper's award-winning Pop-Up Snow Globe Greetings have been a sensation since their introduction in 2005. The globes measure four inches tall when expanded and fold flat into the included note card and envelope. 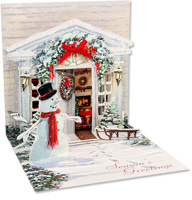 Write your holiday message on the note card, insert the snow globe into the note card, and insert both into the envelope. Insert printed on 50% recycled material. Envelope made with 60% post-consumer waste. More Info: Write your message on the back of the card. Extra postage required. Insert printed on 50% recycled material. Envelope made with 60% post-consumer waste. More Info: This unique snow globe design pops up to reveal a 3-dimensional image of a holiday decorated porch and door. A wreath hangs on the door and holly and red ribbons frame the doorway while a snowman welcomes visitors. Up With Paper's award-winning pop-up snow globe greetings have been a sensation since their introduction in 2005. This globe measures five inches tall when expanded and folds flat for mailing. No additional postage is required unless additional weight is added. Write your holiday message on the stationery sheet included with the card. More Info: This unique snow globe design opens to reveal a 3-dimensional image of a room being warmed by the glow of the fireplace while a dog and cat rest at the base of a decorated Christmas tree. Up With Paper's award-winning pop-up snow globe greetings have been a sensation since their introduction in 2005. This globe measures five inches tall when expanded and folds flat for mailing. No additional postage is required unless additional weight is added. Write your holiday message on the stationery sheet included with the card. More Info: This snowflake Christmas card design features a sparkling white snowflake illustration that pops open to create a 3-dimensional snow globe. Up With Paper's award-winning pop-up snow globe greetings have been a sensation since their introduction in 2005. This globe measures five inches tall when expanded and folds flat for mailing. No additional postage is required unless additional weight is added. Write your holiday message on the stationery sheet included with the card. More Info: Up With Paper's award-winning Pop-Up Snow Globe Greetings have been a sensation since their introduction in 2005. The globes measure four inches tall when expanded and fold flat into the included note card and envelope. Write your holiday message on the note card, insert the snow globe into the note card, and insert both into the envelope. 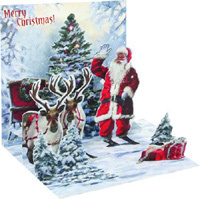 More Info: Santa, his reindeer and sleigh are the focus of this wonderful 3-dimensional Christmas card that features multiple layers of images that pop up when you open the card. 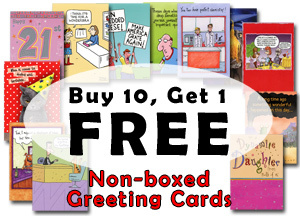 There is plenty of room to write your message on the back of the card. Extra postage required. More Info: The intriquite design of this pop-up Christmas card is wonderful as multiple layers of artwork pop up to showcase the message 'Joy to the World'. 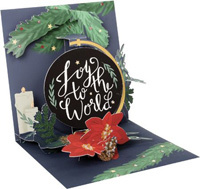 The circular die cut panel that showcases the 'Joy to the World' message is suspended by string so it floats and rotates between the gold foil curving arm. The other layers of artwork include poinsettias, garland, evergreen branches and pine cones. Gold foil stars accent various areas of the card. 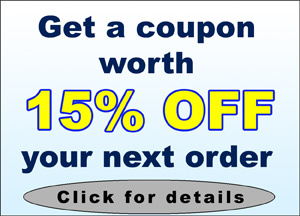 Your personal message can be written on the back panel of the Christmas card. More Info: This wonderful snow globe design pops up to reveal a 3-dimensional image of a unicorn trotting through a group of evergreen trees while snow falls from the sky. Thin lines of gold foil are used to outline the shape of the unicorn and its mane bringing a beautiful shimmer to the card. Gold foil lettering is used on the attached message tag that reads 'wishing you a Magical Christmas'. This globe measures five inches tall when expanded and folds flat for mailing. No additional postage is required unless additional weight is added. Write your holiday message on the stationery sheet included with the card. Up With Paper's award-winning pop-up snow globe greetings have been a sensation since their introduction in 2005. More Info: This delightful snow globe design pops up to reveal a 3-dimensional image of Santa's legs and feet as he descends through the chimney. The mantel is decorated with vines of holly, candles and stockings, a wreath hangs on the wall, and presents surround the fireplace hearth. Sparkling glitter accents the entire globe and is used on the wreath, stockings, holly, gift wrap, fireplace and Santa's suit. The attached message tag reads 'Merry Christmas'. The globe measures five inches tall when expanded and folds flat for mailing. No additional postage is required unless additional weight is added. Write your holiday message on the stationery sheet included with the card. Up With Paper's award-winning pop-up snow globe greetings have been a sensation since their introduction in 2005. 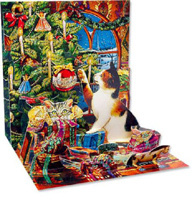 More Info: This pop-up Christmas card features layers of illustrations that wish a 'Merry Christmas' when the card is opened. The interior features die-cut slots to hold a gift card. Write your personal message on the back of the card. Extra postage required. More Info: Merry Christmas is the message on display when this 3-dimensional snow globe Christmas card is opened. Multiple panels criss-cross to create a wonderful look of depth when it's fully expanded. The award-winning pop-up snow globe greetings from Up With Paper have been a sensation since their introduction in 2005. This globe measures five inches tall when expanded and folds flat for mailing. No additional postage is required unless additional weight is added. Write your holiday message on the stationery sheet included with the card. More Info: This unique snow globe features a nativity scene with Jesus, Mary and Joseph and two shephards that pops open to create a 3-dimensional snow globe. Glitter accents brings a sparkle to the design. Up With Paper's award-winning pop-up snow globe greetings have been a sensation since their introduction in 2005. This globe measures five inches tall when expanded and folds flat for mailing. No additional postage is required unless additional weight is added. Write your holiday message on the stationery sheet included with the card. More Info: This unique snow globe Christmas card design pops open to create a 3-dimensional snow glob featuring a nutcracker and ballerinas dancing in front of an evergreen tree. Glitter accents bring a sparkle to the design. Up With Paper's award-winning pop-up snow globe greetings have been a sensation since their introduction in 2005. This globe measures five inches tall when expanded and folds flat for mailing. No additional postage is required unless additional weight is added. Write your holiday message on the stationery sheet included with the card. More Info: This unique snow globe design pops up to reveal a 3-dimensional image of seven cute owls sitting in the branches of a white tree. Sparkling glitter in the snow, crescent moon and owls creates a wonderful twinkle. The message tag reads 'Merry Christmas'. This globe measures five inches tall when expanded and folds flat for mailing. No additional postage is required unless additional weight is added. Write your holiday message on the stationery sheet included with the card. Up With Paper's award-winning pop-up snow globe greetings have been a sensation since their introduction in 2005. More Info: This unique snow globe features a white reindeer silhouette, white trees and sparkling glitter snowflakes against a dark night sky and pops open to create a 3-dimensional snow globe. Up With Paper's award-winning pop-up snow globe greetings have been a sensation since their introduction in 2005. This globe measures five inches tall when expanded and folds flat for mailing. No additional postage is required unless additional weight is added. Write your holiday message on the stationery sheet included with the card. More Info: Multiple layers of die cut images are on display as you open this 3-dimensional pop-up Christmas card. 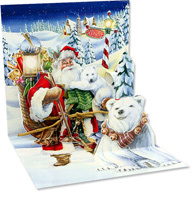 A wonderful scene of Santa at the North Pole with polar bears is highlighted by glitter accents that bring his lantern to life. Write your message on the back of the card. Extra postage required. 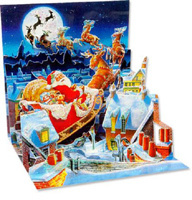 More Info: This wonderful 3-dimensional Christmas greeting card features Santa, an elf, reindeer and a couple of curious bunny rabbits that watch as Santa prepares for his sleigh ride to deliver toys. Up With Paper's award-winning Pop-Up Snow Globe Greetings have been a sensation since their introduction in 2005. 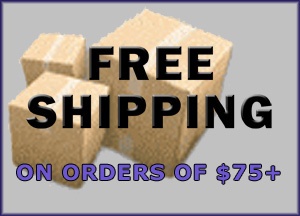 This large globe measures six inches tall when expanded and folds flat for mailing. Includes a tag with coordinating artwork for writing your personal holiday message. More Info: This unique snow globe design pops up to reveal a 3-dimensional image of Santa engineering a red steam engine train through a snowy forest while deer hide in the trees. Glitter accents the imagery to provide a sparkle to the artwork. The message tag reads 'Merry Christmas'. This globe measures five inches tall when expanded and folds flat for mailing. No additional postage is required unless additional weight is added. Write your holiday message on the stationery sheet included with the card. Up With Paper's award-winning pop-up snow globe greetings have been a sensation since their introduction in 2005. More Info: This cute snow globe design pops up to reveal a 3-dimensional image of Santa and Rudolph driving a red car with presents on the roof. Small accents of glitter in the snow and on the car, gifts and Christmas hats add a wonderful sparkle to the card. This globe measures five inches tall when expanded and folds flat for mailing. No additional postage is required unless additional weight is added. Write your holiday message on the stationery sheet included with the card. Up With Paper's award-winning pop-up snow globe greetings have been a sensation since their introduction in 2005. 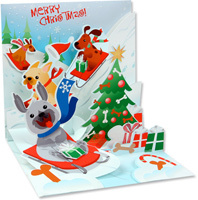 More Info: This 3d Christmas card card features multiple panels of cute dog illustrations that 'pop up' when the card is opened. The interior also has die-cut slots to hold a gift card. Write your message on the back of the card. Extra postage required. 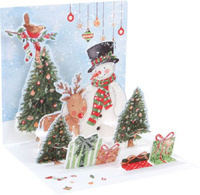 More Info: Just open this Up With Paper Treasures Christmas card and multiple layers of images pop up! Cute illustrations of a snowman, reindeer, Christmas trees and presents are featured. 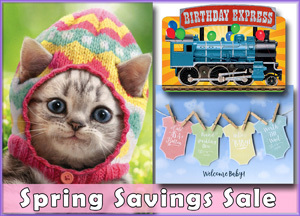 Includes five self-adhesive greetings to personalize your card. Write your message on the back of the card. Extra postage required. More Info: Sparkling glitter brings a shimmer to the snowy owl that serves as the focal point of this wonderful 3D Christmas card from Up With Paper. Dots of white snow seem to hang in the air. This large snow globe measures six inches tall when expanded and folds flat for insertion into the envelope. Write your personal holiday message on the attached tag that features coordinating artwork. 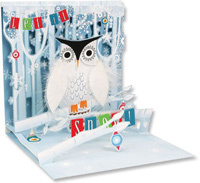 More Info: A wonderful owl illustration with soft feathers serves as the theme of this 3D Christmas card that opens to reveal multiple layers of die cut images. Features touches of glitter on the snowflakes. Choose one of the included message tags (Merry Christmas, Peace, Happy Holidays, Season's Greetings, or blank) to attach to the inside of the card. Write your message on the back of the card. Extra postage required. 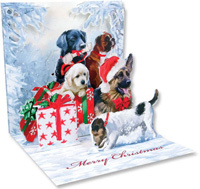 More Info: This cute pop up Christmas card opens to reveal 3-dimensional images of four dogs preparing for Christmas including 2 dogs in sweaters, one dog wearing reindeer antlers and a small dog inside a hanging stocking. Gold foil embellishments are used in the ornaments, antlers, gift wrap and sweaters to add a wonderful shimmer to the card. Your personal message can be written on the back panel of the Christmas card. 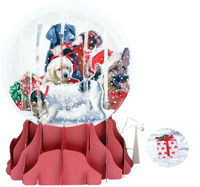 More Info: This wonderful snow globe design pops up to reveal a 3-dimensional image of a four dogs preparing for Christmas including 2 dogs in sweaters, one dog wearing reindeer antlers and a small dog inside a hanging stocking. Gold foil embellishments are used in the ornaments, antlers, gift wrap and sweaters to add a wonderful shimmer to the card. This globe measures five inches tall when expanded and folds flat for mailing. No additional postage is required unless additional weight is added. Write your holiday message on the stationery sheet included with the card. Up With Paper's award-winning pop-up snow globe greetings have been a sensation since their introduction in 2005. More Info: This cute snow globe design pops up to reveal a 3-dimensional image of a group of five cats that have knocked over the Christmas tree. Glitter is used throughout the artwork to bring a wonderful sparkle to the ornaments, Christmas lights, wrapping paper and bows. The message tag reads 'Have a Meowy Christmas'. This globe measures five inches tall when expanded and folds flat for mailing. No additional postage is required unless additional weight is added. Write your holiday message on the stationery sheet included with the card. Up With Paper's award-winning pop-up snow globe greetings have been a sensation since their introduction in 2005. Inside: Is it time to open presents Yeti? More Info: An adorable yeti (abominable snowman) with simulated white fur and google eyes is featured on this wonderful pop-up Christmas card from the 'Treasures' line by Up with Paper. 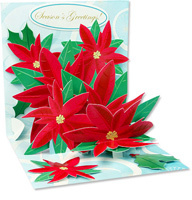 Multiple layers of pop-up images create a 3D look including poinsettias, candy canes, presents and a Christmas tree. Sparkling glitter accents the artwork. 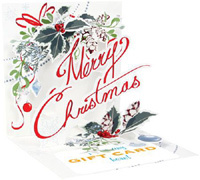 Your personal message can be written on the back panel of the Christmas card. Front: Is it Christmas Yeti? More Info: This wonderful snow globe design pops up to reveal a 3-dimensional image of a Yeti (abominable snowman) holding a present near a small Christmas tree surrounded by gifts. The artwork is enhanced with glitter highlights to bring a sparkle to the snowflakes, gift wrap, ornaments and scarf while 'googly eyes' bring a wonderfully silly look to the Yeti. The message tag reads 'Is it Christmas Yeti?'. This globe measures five inches tall when expanded and folds flat for mailing. No additional postage is required unless additional weight is added. Write your holiday message on the stationery sheet included with the card. Up With Paper's award-winning pop-up snow globe greetings have been a sensation since their introduction in 2005.